Another rude early awakening but this time for our adventure into Jordan. Rather encouragingly, once we met our group we were handed instructions what to do if for any reason you were abandoned at the border or detained. 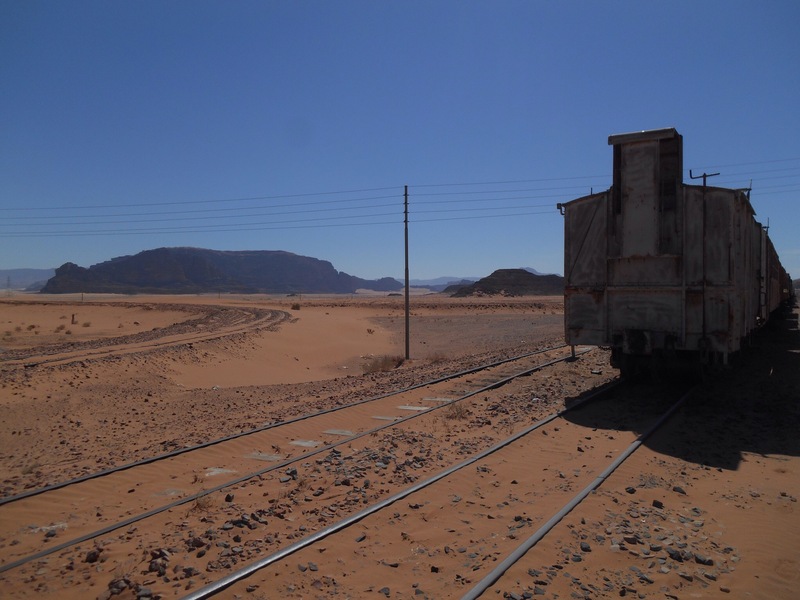 We then headed north to the on other most land border crossing with Jordan. At the crossing we paid our exit fees, were stamped out and ferried across to meet our Jordanian guide Ali to enter Jordan. Mum was happily pointing out members of the royal family from their portrait in the wall when he border control summonsed her over. It thought this was it, two minutes into our stay she was going to be deported. Actually, the man was proud of the heritage and explained to her the family ties, then letting her continue on to meet us. Accompanying us on our time in Jordan, as is apparently procedure for groups larger than 5 people, we had a member of the tourist police with us, and we set off south. The currency in Jordan is Jordanian Dinars, roughly 1 to 1 with the pound. A country of 9 million but with only 30% country inhabited, 95% Muslim. It also produces fresh fruits and shares the Dead Sea with Israel with whom there has been a peace treaty since 1994. Jordan was also once a British mandate between 1921- 46 from when it became Trans Jordan ruled by the royal family. 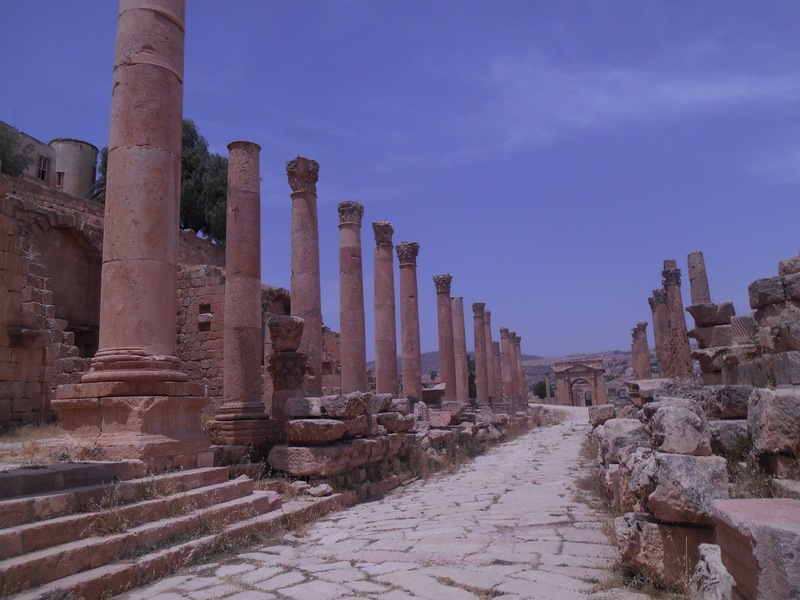 Said to be direct descendants of the prophet Mohammed, this dynasty is in its fifth generation, the current King called King Abdullah II since 1999, a direct descendent of King Abdullah I who founded modern Jordan. The bus brought us out of the Jordan Valley and we passed houses, all resembling each other, simple box design with light coloured rock. At this point, most of us rested our eyes until we arrived at Jesaba, the remains of a Roman city. 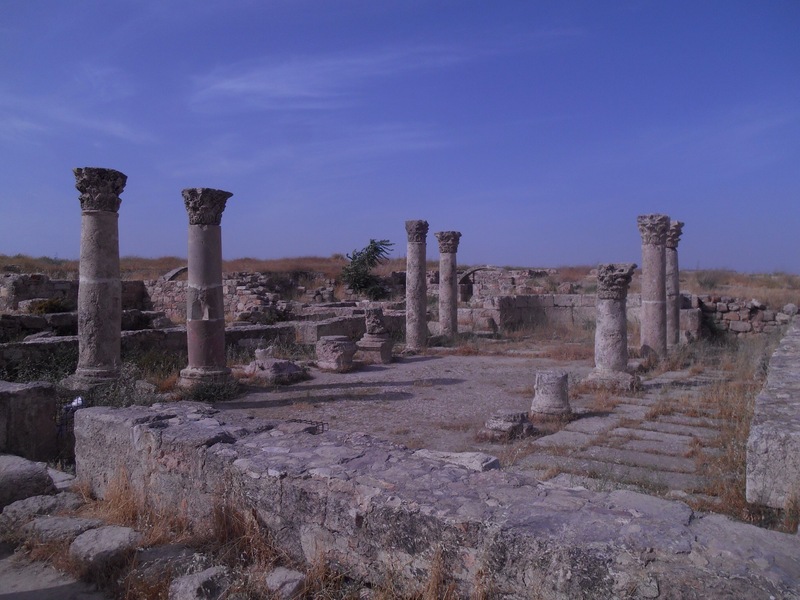 It is claimed to be the most well preserved Roman site outside of Italy, and certainly it far exceeded my expectations. 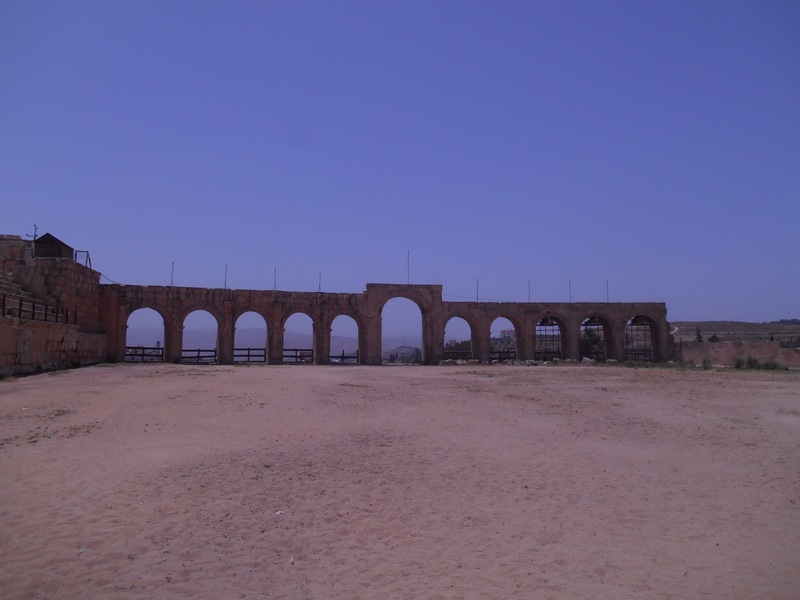 We entered through an impressive gate, the other side of which was a largely complete hippodrome which would have been used for shows and entertaining 1500 visitors. Further beyond this, we entered the city gates. This would have been the recreational part of the city, the shops, churches and theatres making up the main infrastructure with the residential houses on the opposite bank, where the new city of Jesaba now stands. 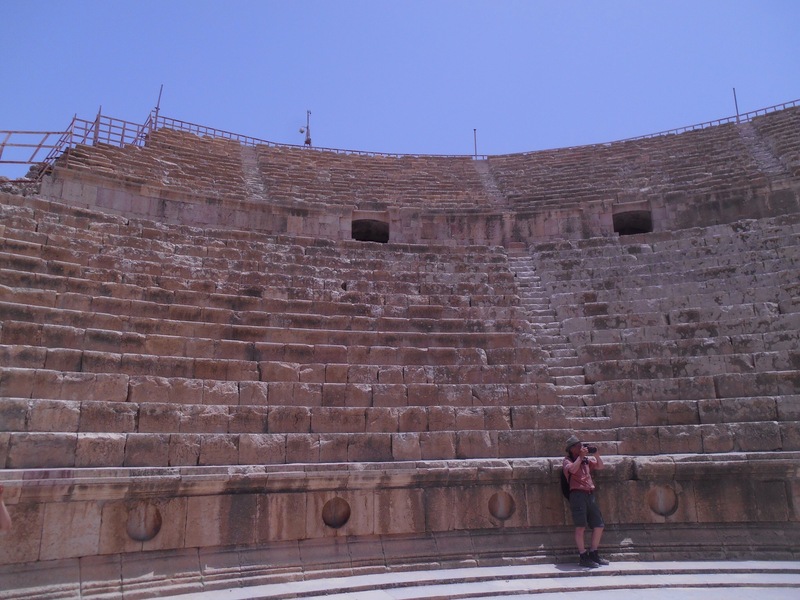 In the largely complete stadium you could imagine the many spectators looking down over the stage where stairs to the backstage could still be seen. In the very centre was an acoustic stone which I tried, certainly your voice projects simultaneously in every direction from this finely tuned spot. Also around the seats was more acoustic mastery, indents when spoken into you could clearly hear the next person. In came two Jordanian men with instruments, the bagpipes and a drum. Our guide Ali, who had a great sense of humour, announced they would play us some traditional Jordanian music just before the sounds of Scottish melodies rang out, a remnant from the time of the British Mandate. Other buildings that made up this magnificent city was a courthouse, 7 sets of 7 stairs carrying people from the main street. In front stood 11 pillars in incredible decorative condition for their age. 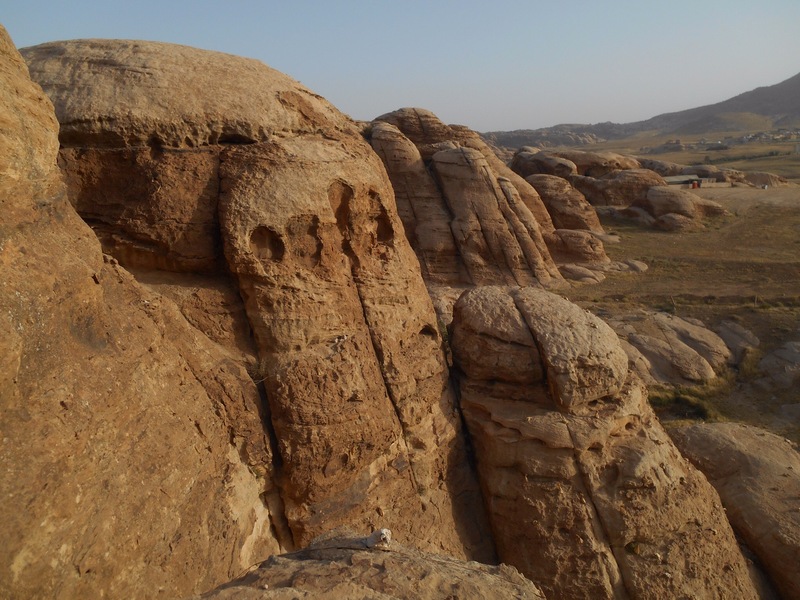 Although Jordan has been privy to earthquakes occurring every 90-100 years throughout its history, with a particularly strong series during the 9th century, each time the original rocks have been able to be used to restructure or demonstrate a rebuild. Down on the street level there was shop arches, sewerage systems and an ornate fountain, really allowing the imagination to build on every day life in this colourful city. We had a buffet lunch in Jesaba of many fresh and tasty dishes from curries to hummus were produced in front of us, then we headed to Amman, Jordan’s capital. 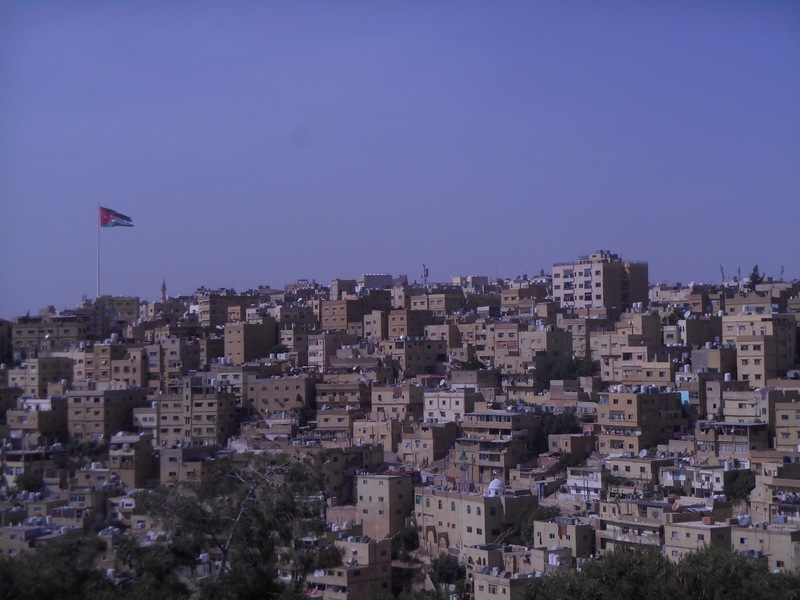 Amman boasts the biggest flag in the Middle East, dwarfing much of the architecture below it as the giant 30 by 15 metre flag stands 126 metres in the area. The flag is black, white and green representing the tribes of Islam, then a red triangle commemorating the royal family and a 7 pointed Islamic star. 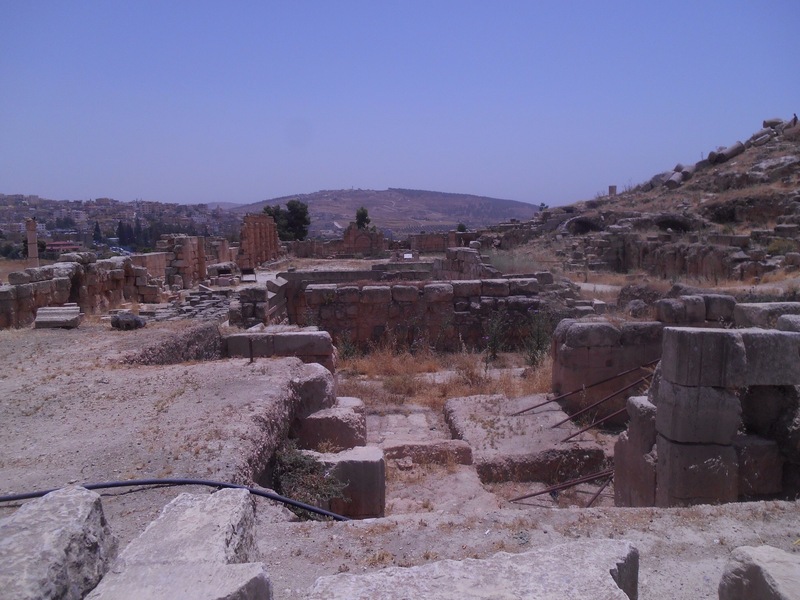 This area has previously been known as Rabbath Ammon, capital of the Ammonites, and subsequently Philadelphia in Roman times and eventually becoming Amman. On top of this historic hill once would have stood an important space for the Ammonites, a temple destroyed by King David who fought regularly with the Ammonites. 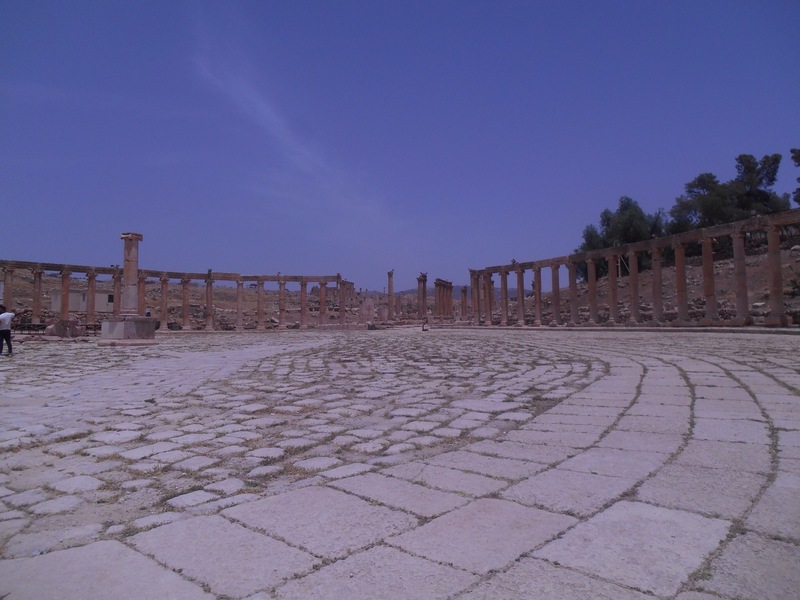 During Roman settlement, any remains were cleared to make way for the Temple of Hercules. Now, on the same hill also sits a mosque. 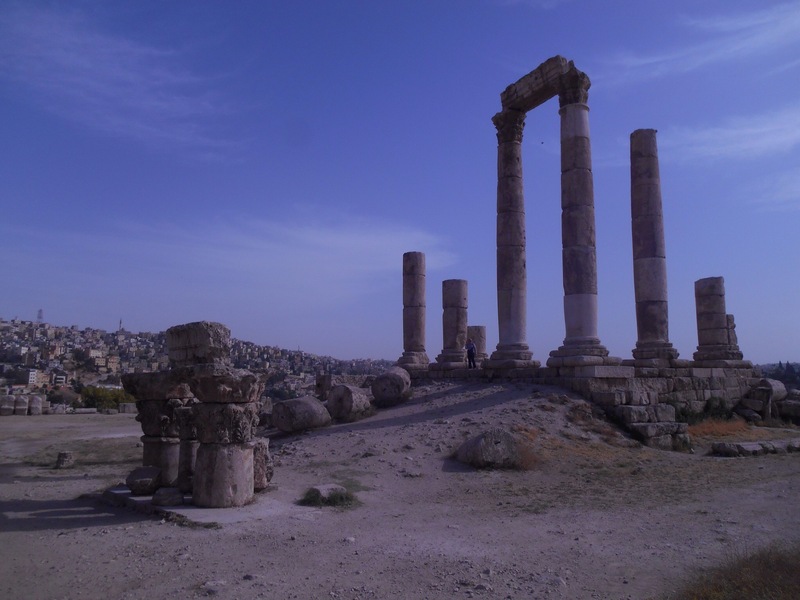 We drove through the contrasting parts of Amman, firstly the old town uniformly sprawled across the hill. 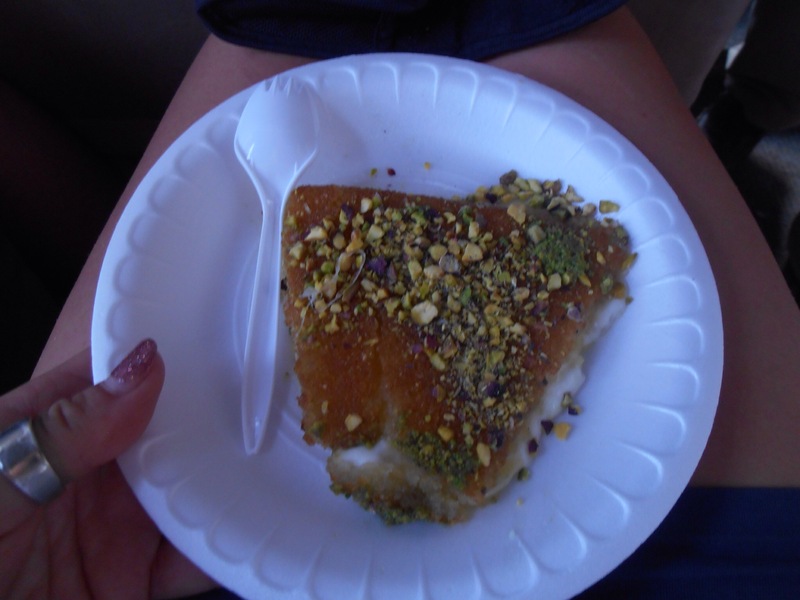 We stopped in the busy soq (markets) and Ali brought us all some Jordan Knafeh to try. The base was a white cheese, stringy like mozerella, topped with a sweet topping and pistachio nuts. It was different even to the Knafeh I tried in Jerusalem, a Jordanian twist. Next we drove to the new part of Amman where embassies and beautiful mansions lined the streets. Here the housing was equivalent to a few million pounds so there is definitely money in the city. Ali was happy to answer all of our questions about Jordan as well as keen to communicate how safe and advanced it was. One of the main questions on everyone’s mind was its position in the Middle East, is Jordan going to go the same way as its neighbours? He explained that the main conflict occurs between Somlis and Shias, divisions of the Muslim faith, once united but now growing increasingly contentious in their different readings of the Quran. He explained that Jordan only has somlis, so there is no division and thus one of the reasons there is less threat of complicated political struggles. Jordan has however taken in a large amount of refugees, 2 million from Syria and before that from Iraq. 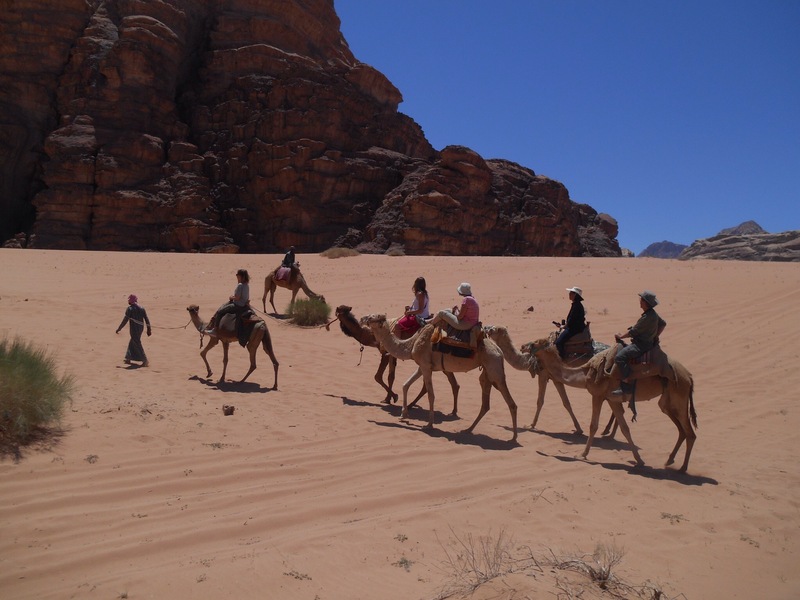 Life in Jordan is not easy, unemployment higher than it should be and suffering economically with its loss of tourism, however he was positive and open to questions. Next he addressed other things commonly known without context, such as the concept of multiple wives. Yes he explained, it would be legal to have up to four wives, but this certainly is not common practice or something which should be entered into lightly. Unable to conceive children maybe a second wife would be considered, in his opinion this is a family decision. A man may also marry a woman if she has been widowed or to take care of another family. He stressed to us that this law assumes that every wife should be treated 100% equally and would require good finances! He assured us woman were increasingly part of the education system and workforce and could be found in every profession. Children however do not leave the family home until they are married and girls could not travel abroad alone. It’s always hard to weigh up this information and gain a true picture of what it would be like to be Jordanian, a woman, a Muslim. Certainly we didn’t see that many women serving, or at all for that matter. It felt safe, friendly, progressive in many ways, but a completely different culture from modern, neighbouring Israel. 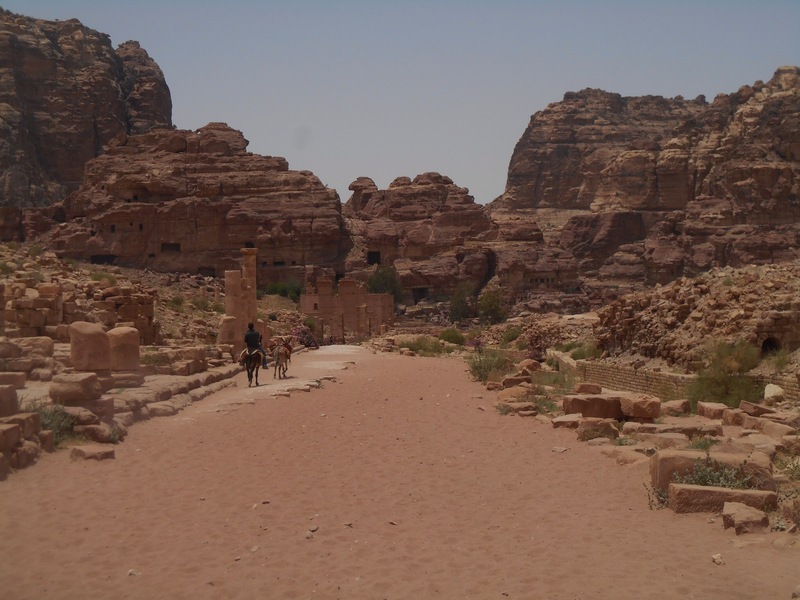 We had a long drive south to where would stay the night near Petra in a Bedouin camp. 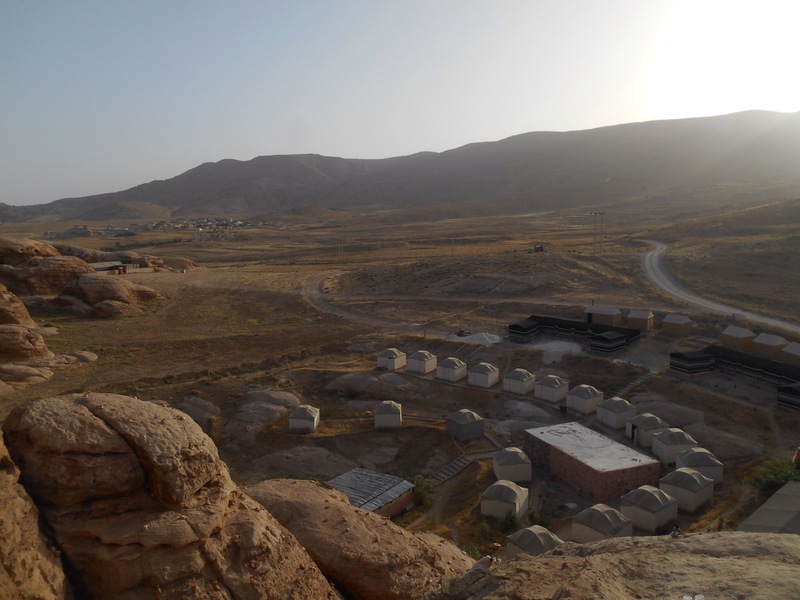 Arriving after dark, our first sight was a hill covered in candles twinkling, then we were inside a basic camp, a big firepit with seating, an open tent for buffet and seating areas all covered in the beautiful red and black Bedouin print material. 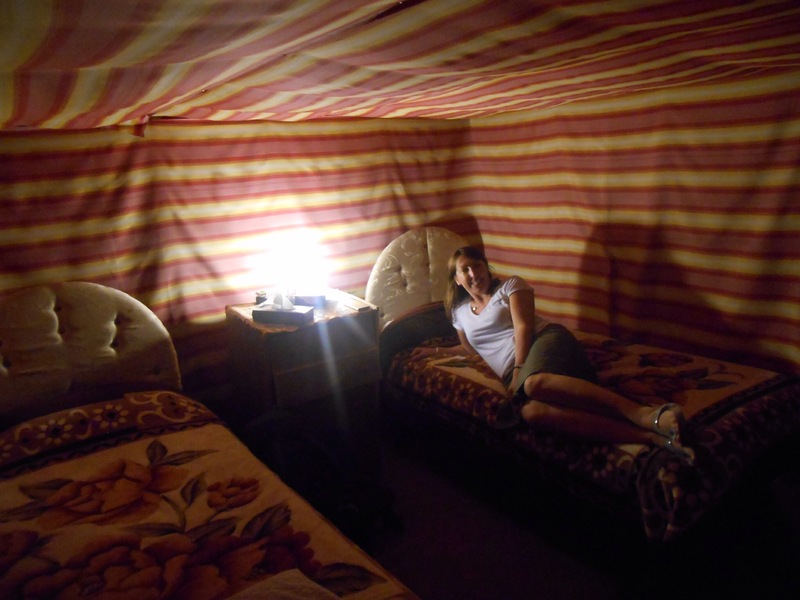 The food was lots of fresh vegetable dishes, breads and cream cheeses, with some lentil soup to start and then we were all pleased to be shown to our rooms so we could freshen up, the hot day only added to by the cooling breeze which meant we were all very dusty and windswept. Inside the tent was a very comfortable setting. Mums and I had twin beds with lots of bedding, light run of a generator from after dark until midnight and a candle for beyond that. In the evening around the fire we listened to some of the Bedouin people playing instruments and singing. A few of us were pulled up to learn some basics steps to dance around the fire, increasing in difficulty as the beat got faster. The country is Muslim and most accept no drinking making for a different camping experience, instead a pot of sweet tea is kept in the fire and your glass is continuously filled. It is aromatic with spices like sage but very sweet. The next morning I scrambled up the hill to watch the sunrise over the mountain beyond. From the higher vantage point you could make out the shape of the land, lots of rounded rocky outcrops with donkeys and camels roaming inbetween and occasional other camps. 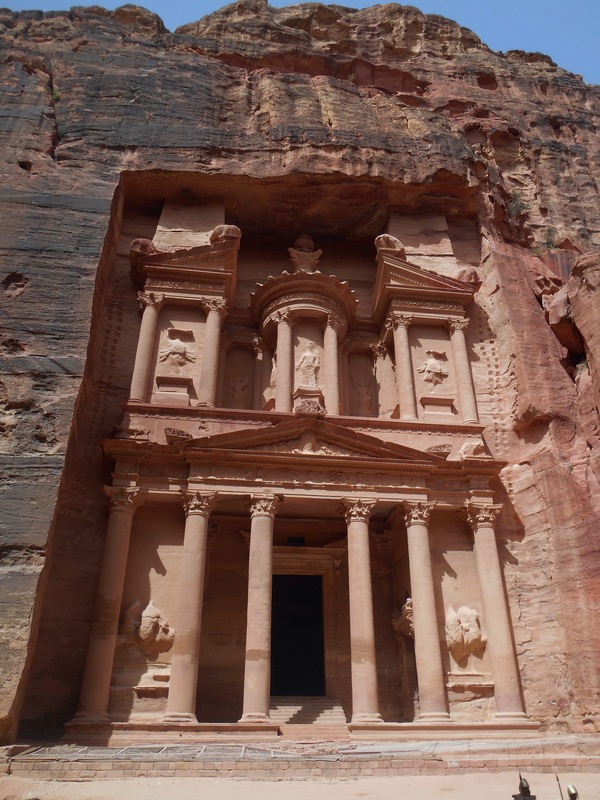 Today was Petra day, one of the new seven wonders of the world, hidden until 1825, the abandoned capital of the Nabouteen people who came originally from Saudi Arabia. They had planned to stop in Israel but found this area of incredible natural defence and set up a city which flourished in the mountains. 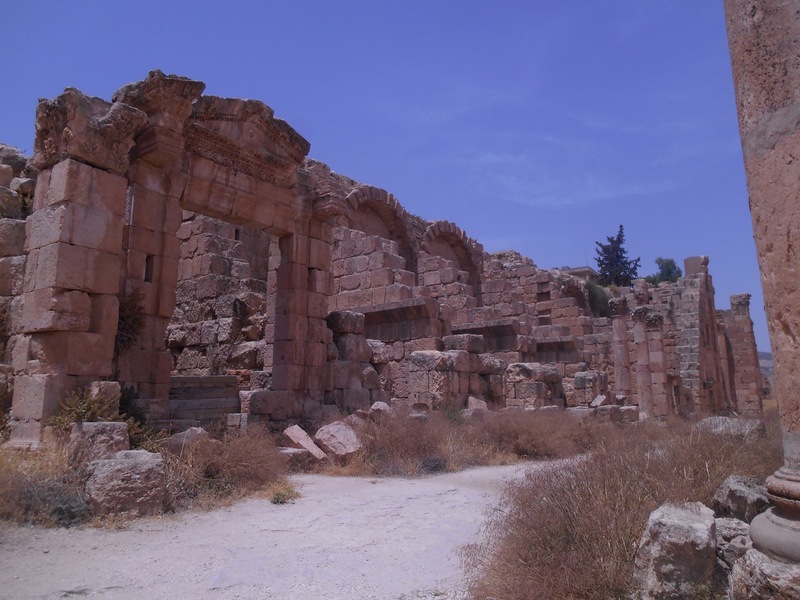 During Roman invasions the Nabouteens paid the Romans off rather than fought them, gaining riches through trade routes. Romans later switched the trade routes away from this area, cutting them off and eventually when the Nabouteens were unable to fight or pay, they were kicked out and the Romans used the city. 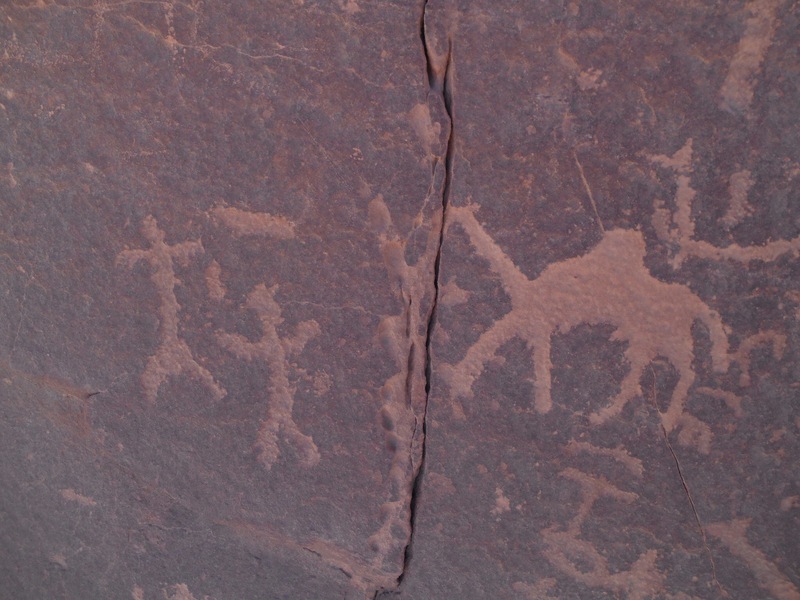 The most recent settlers were the Bedouin nomadic people until they were kicked out in 1989 to preserve the site for tourists. We walked from the visitors centre to the gate, around 700 metres where you could see graves of the Nabouteen people. From the markings you can see how many people were buried inside and they have estimated that at the height of the city 30,000 people lived here. The whole time you are dropping down until you enter a natural siq, a crevice between two rock walls which lasts for 1.3km. 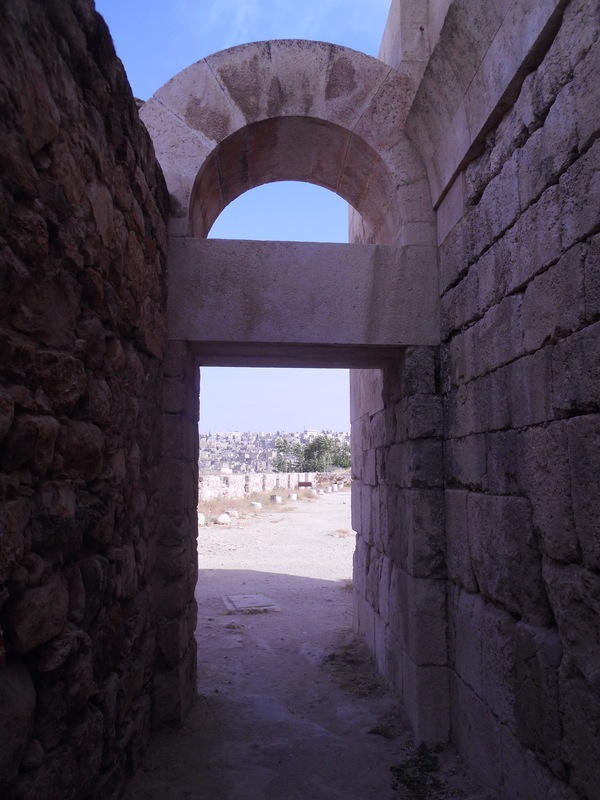 This would have been the only entrance to the city, defended by large wooden gates. As you walk continuing downhill, the incredible rock faces grow ever taller around you and incredible colours of reds, blacks, oranges and greys run through the rock. The remains of drains channelling water into the city show how advanced this settlement was, even purifying the water on the way in by pools to drain the sediment out. 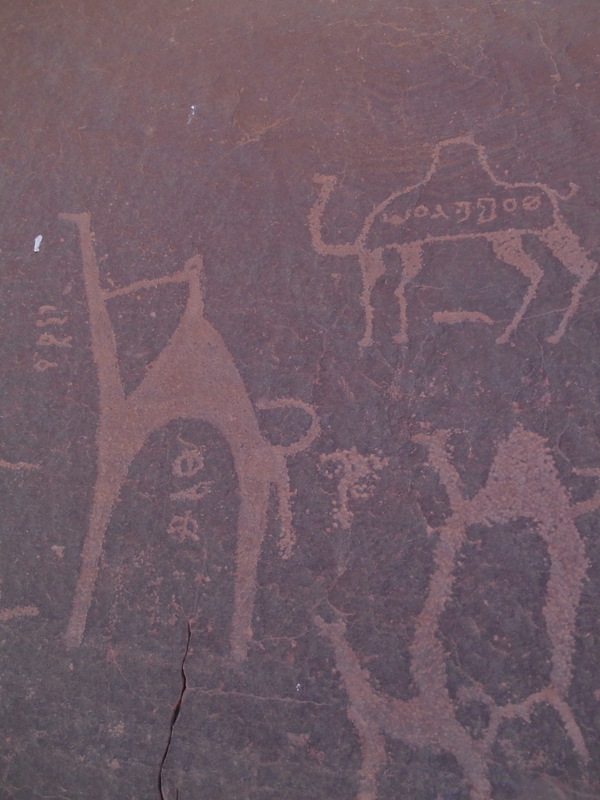 Markings in the wall show worship places observed by the travellers. The gods drawn simply by shapes and blocks rather than faces, believing not to represent the gods as like beings. 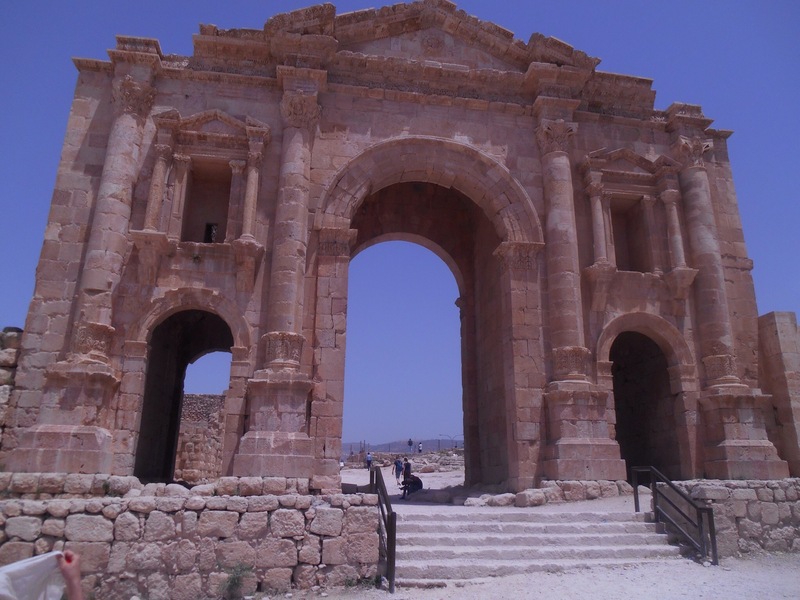 Amongst the Nabouteen artefacts, Roman additions can be seen, such as carved men and camel statues to show the caravan stations where incoming groups would offload before entering the city walls. By this point I was already taking too many photos of the fascinating natural surroundings and Ali said “now if I can just get you all to look up here, what do you see?” As we puzzled he then pointed to our left and there, the treasury appeared at the end of the siq, the recognisable face of Petra, wow. 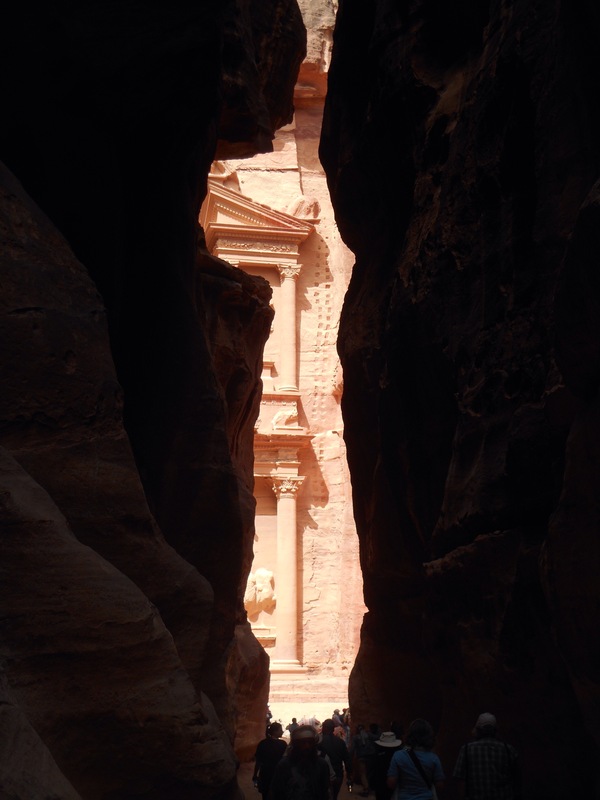 We emerged into the light, a bustling group infront of the treasury, camels, carts and tourists marvelling at the structure carved entirely out of the rock face. 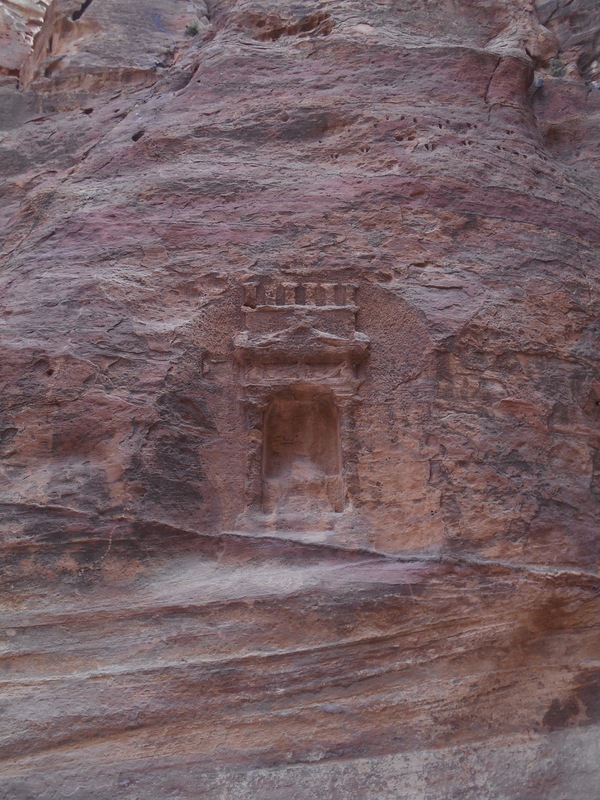 It was first assumed this was a treasury due to the large urn depicted, the gun shots showing that Bedouin discoverers shot at the urn to get it to reveal its secrets. 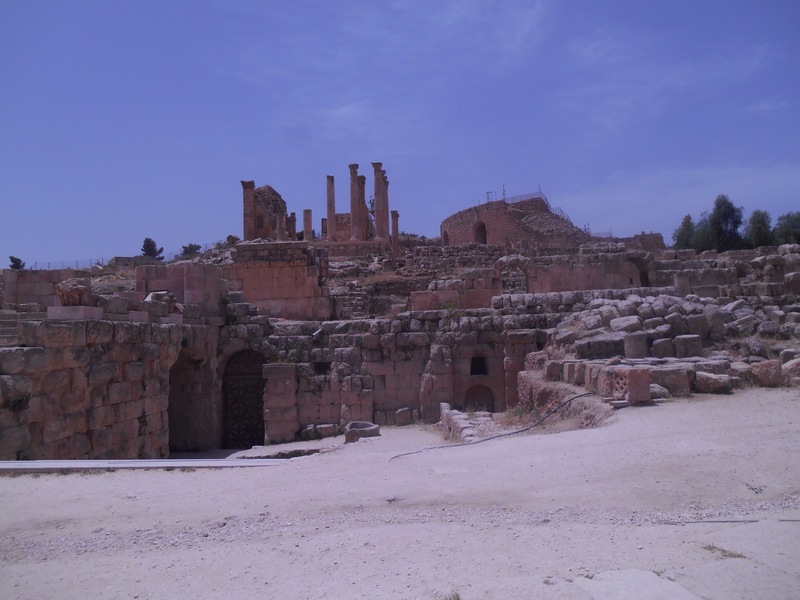 In actual fact this building stands above three tombs, now excavated below ground. It was incredible to be infront of such an iconic feat and the city from now opened out as we followed the streets round to discover many more carved buildings, tombs and shops. 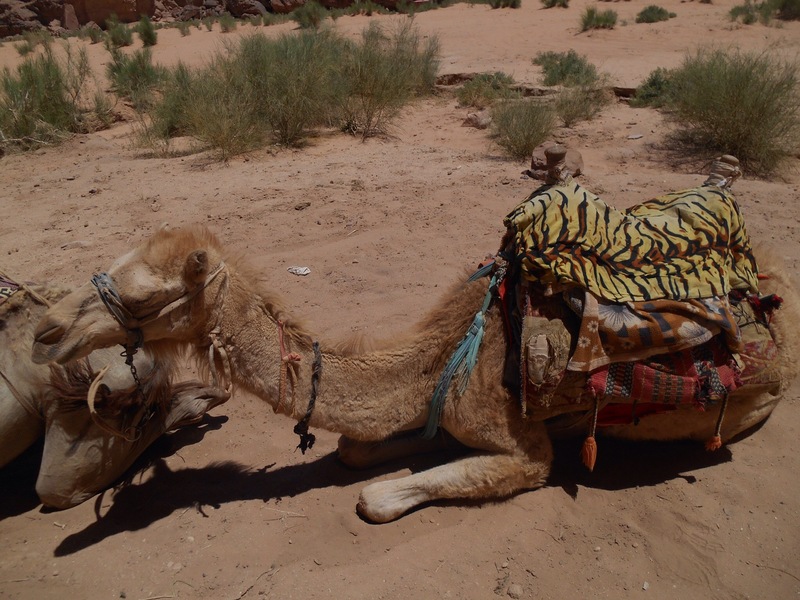 It felt at times like being in the Wild West, camels, donkeys and horses covered in print fabric, bedouins in headscarves, dust and sand everywhere and some shops functioning almost like a high street. 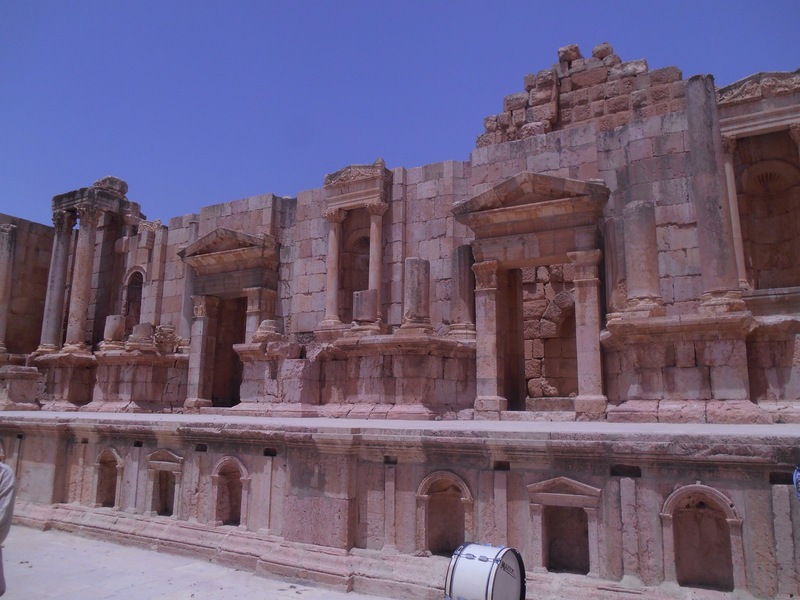 A favourite carving of mine was the theatre, again carved out of one price of rock displaying such a wide range of colours from purples to reds. Further down we entered a long straight strip where Roman influence was clearer, pillars lined the marble streets and the temples to the side were built rather than carved. The buildings had suffered in the earth quakes and even showed early signs of shock absorbers built into the buildings. 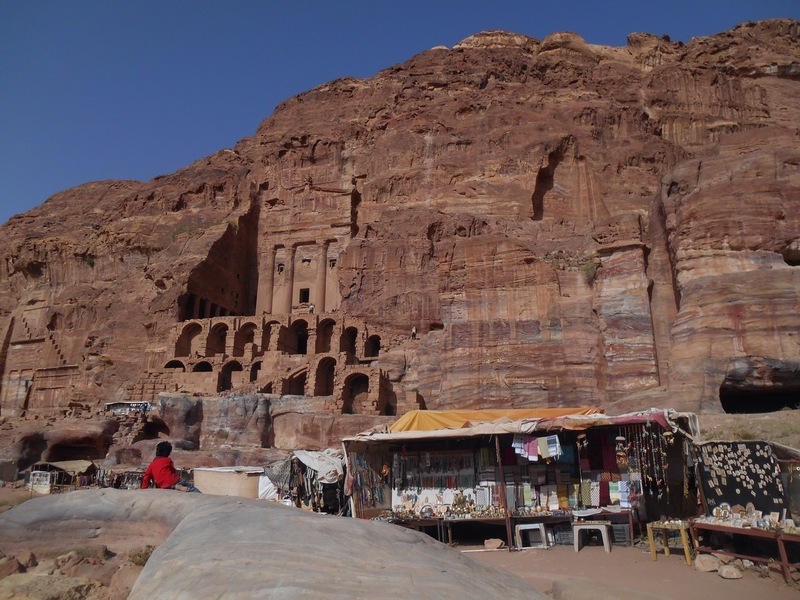 To the right side, royal tombs were carved into the rocks. 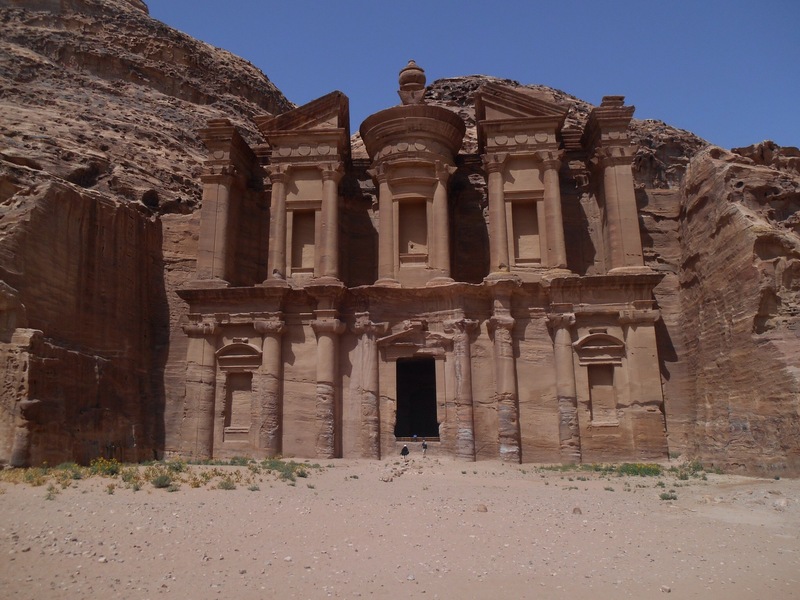 They looked more like intricate palaces than tombs as they characterised the rock face. 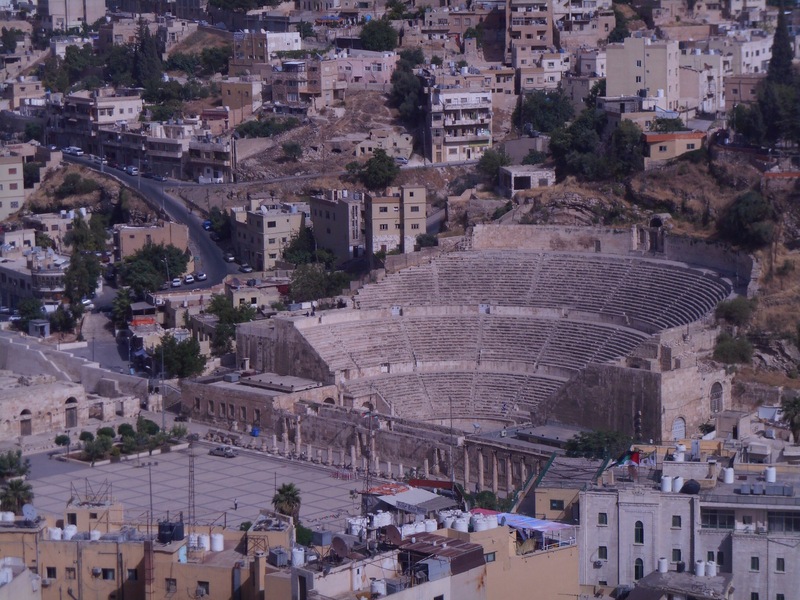 Jordan has suffered in the troubles in the Middle East of the last few years and despite being a stable and safe country, has lost around 70% of its tourism. As such this incredible site was blissfully empty. We had a buffet at a simple restaurant and then got to use the afternoon to explore. With such vast reaches, you could spent 4 days here and not see it all, so we had to gather up our energy and press on. The monastery at the far end of the city was at the end of a climb into the mountains, our guide estimated 800 steps. The walk completely contrasted the rest of the city as you climbed through the stratified rock, marvelling just as much at the sprawling natural beauty as the architectural feats. Little donkeys made their way up and down the steps carrying tourists, but despite the heat we plodded on up. Once we rounded the steps to catch sight of the monastery we knew it was worth the climb. It was wider and vaster than the treasury, but being more open to the elements it had not weathered as well. Again we virtually had the whole place to our sweaty selves. It was too tempting to take on a further climb to the just visible sign on the horizon saying view, with tantalising signs along the way saying ‘best view in Petra’ and ‘this way to the top of the world.’ Looking back with this perspective shrunk the carved monastery into the hills, to the other side an incredible valley acting as another natural defence. 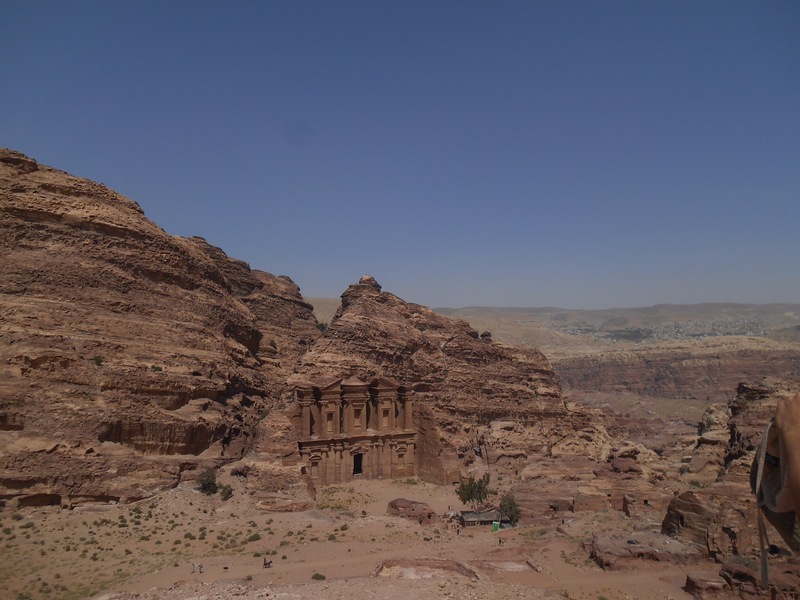 Once back on the main streets of Petra we couldn’t resist another climb to the Royal tombs. 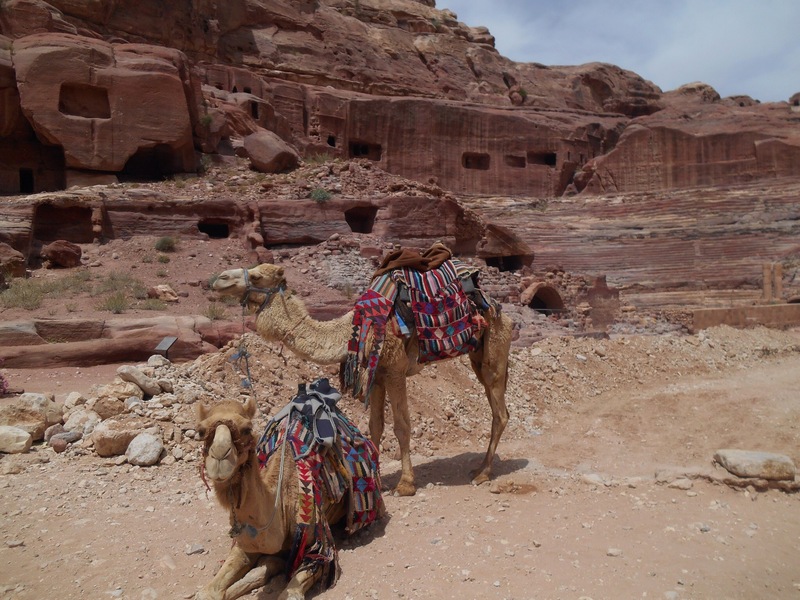 From this great vantage point, the day to day life of Petra on the streets was once again shrunk down and you could see the many caves which housed first the Nabouteens and more recently the Bedouin families. They are natural caves, occurring in several levels up the rock face, cool in summer and warmed in winter by cooking indoors. As a result, blackened roofs mark the history of life here. 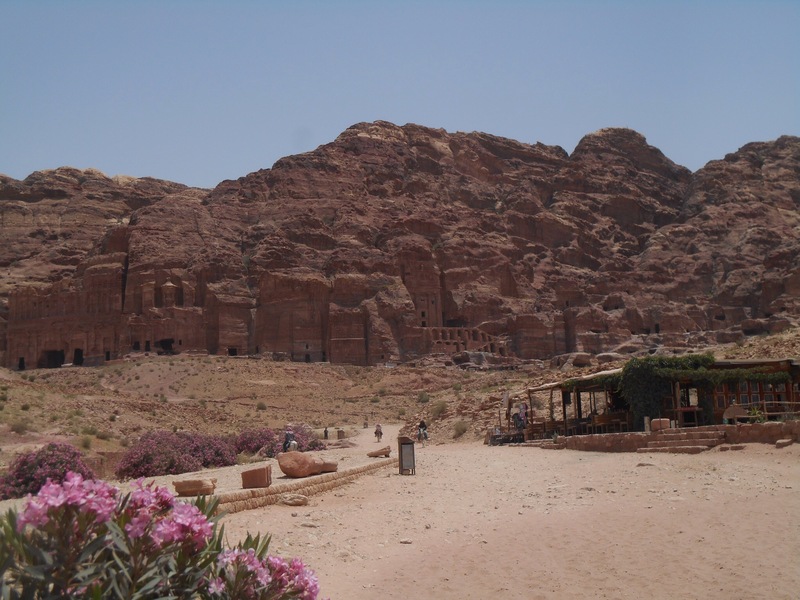 As we began the long return out of the city we came across a film crew, filming what appeared to be a scene from a low budget movie, however Petra has hosted many big films, including Indiana Jones and Laurence of Arabia. 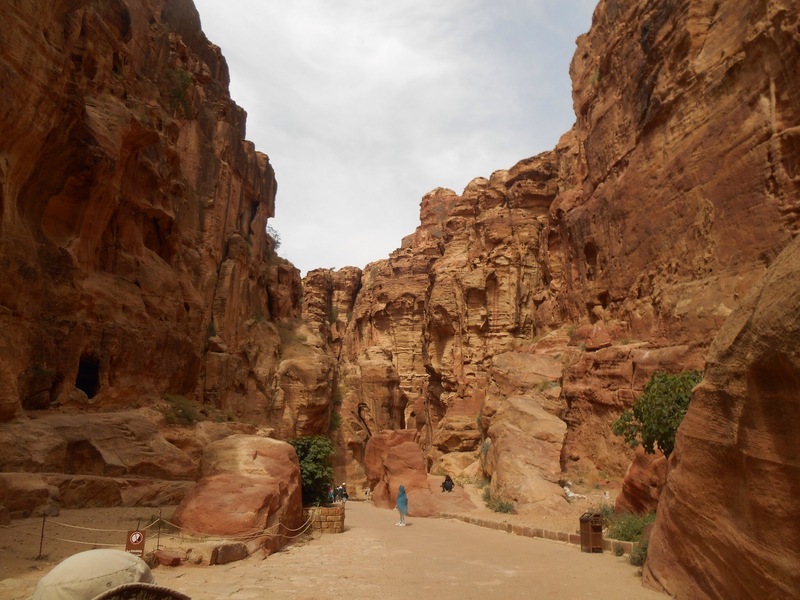 The monastery was probably 8km walk from the gates of Petra and retracing our mornings steps, you saw the city afresh, it’s many changing sections, the incredible natural environment highlighted in the evening sun which brought out the red of the rock. We had managed to wear ourselves out and back at camp the plan was an early night. The reality was socialising with the other campers and the friendly Bedouin camp hosts, the real life captain jack sparrows with their kohl eyeliner. 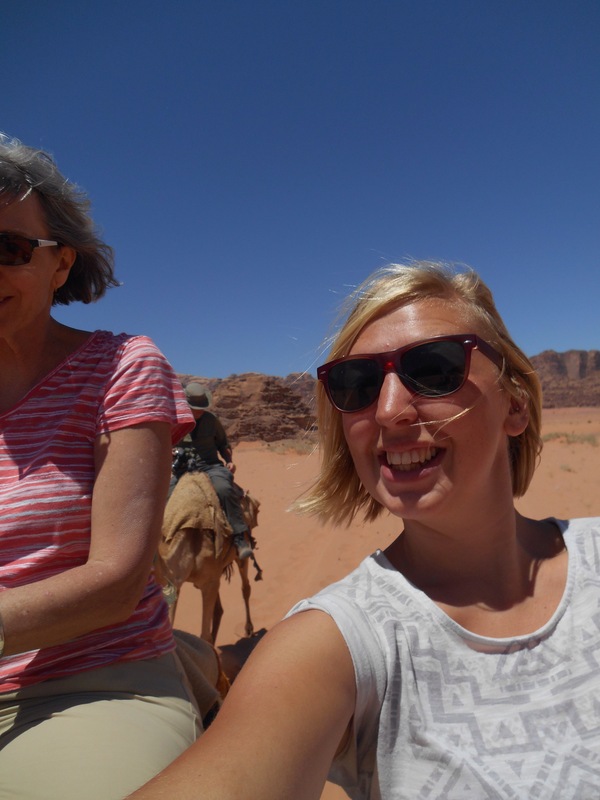 They were hospitable and friendly, as fascinated by us as we were by them, and very keen for us to enjoy Jordan and how special and welcoming it was. They brought mats and blankets out as the evening was much colder and we sat around the fire until 2am as they continuously brought us sweet tea and kept us entertained with their adventures, answering any question as forward as it may be. 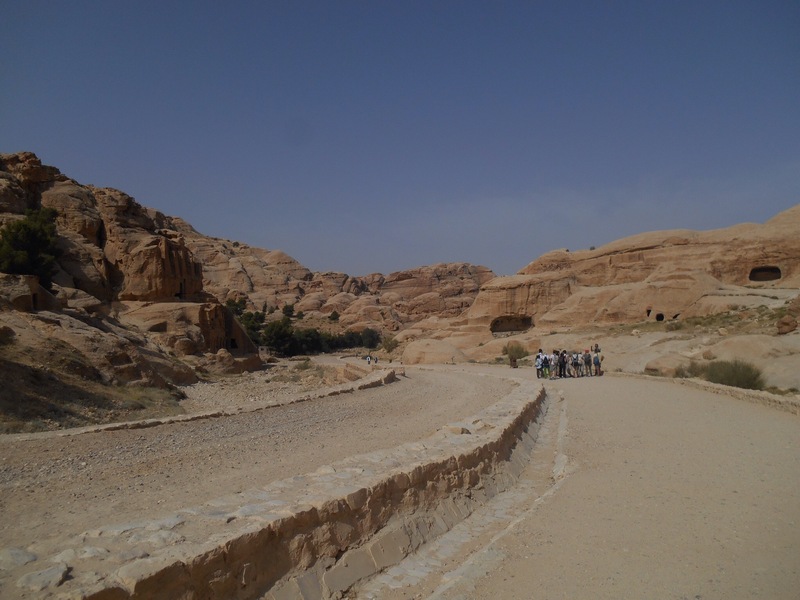 In a bid to explore the desert, the bus began south for a few hours, into the desert surroundings and to Wadi Rum. 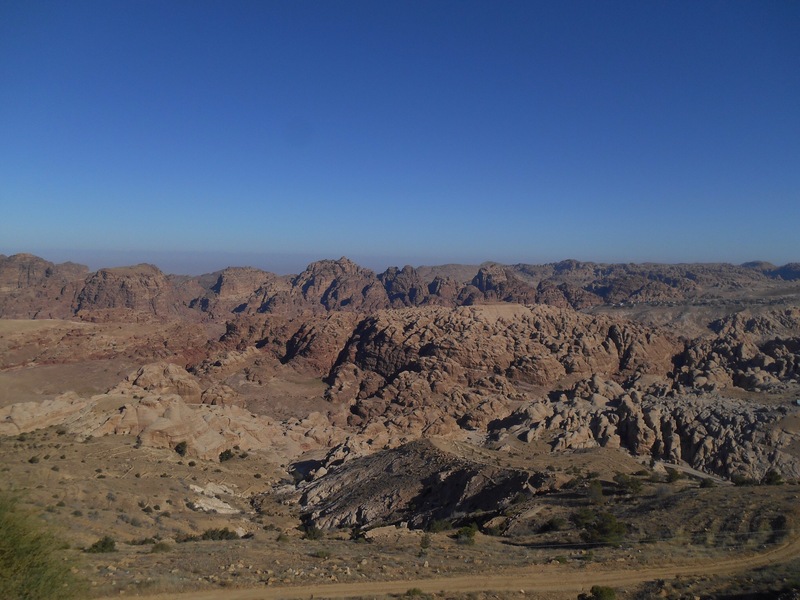 This was Laurence of Arabia country where Laurence had led bedouins through the desert to capture Aqaba. 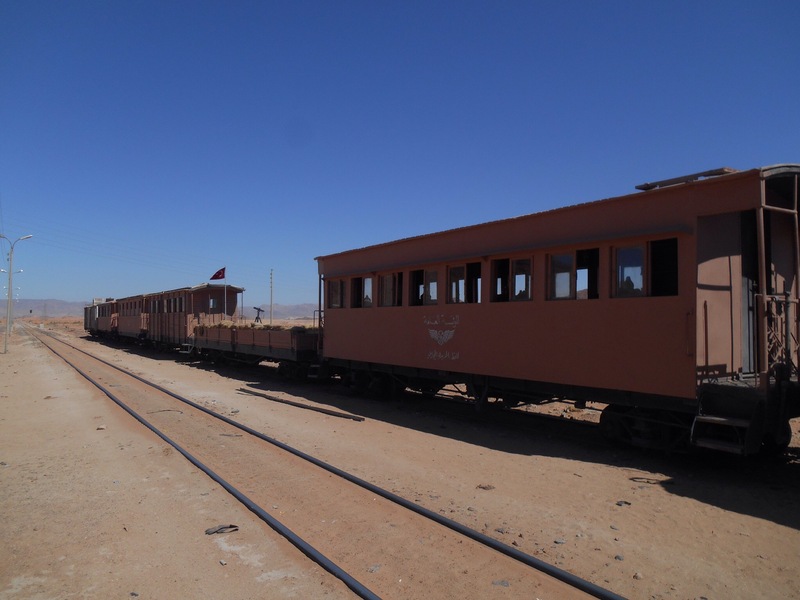 We all piled out to see the steam train which used to connect Jordan with Turkey and Syria and beyond, now it’s old fashioned carriages used only for film sets such as Laurence of Arabia. 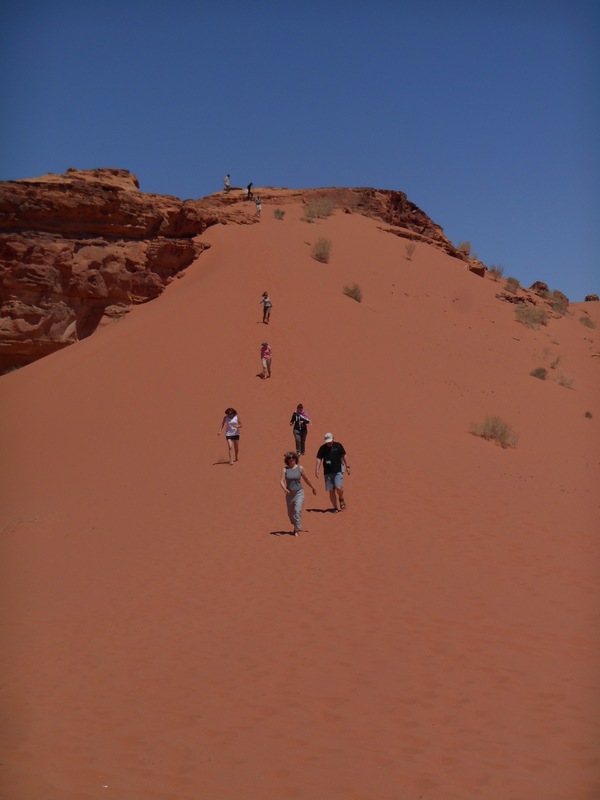 We were to be shown the desert in the back of very old looking jeeps and splitting the group into two, we set off into the vast sandy distance. The wrinkled Rocky Mountains were on every horizon, the most recognisable, the seven pillars of wisdom. Despite the heat underfoot we ran up the sand dunes to be treated to an incredible 360 view around. The most fun bit of course being able to run back down the sand dune at full speed pulling your feet out from under you just in time to prevent falling on your face. Our small jeeps shrank past towering hills and the contrasts of the orange of the sand and bright blue of the sky magnified. 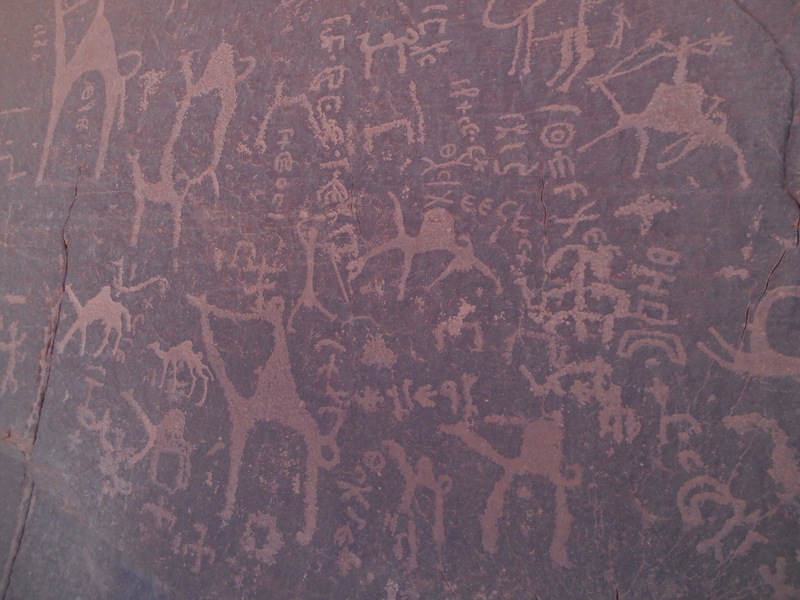 The next time we stopped, Ali showed us Nabouteen rock markings, symbols to the passing caravans of warnings, water, animals and also directions. 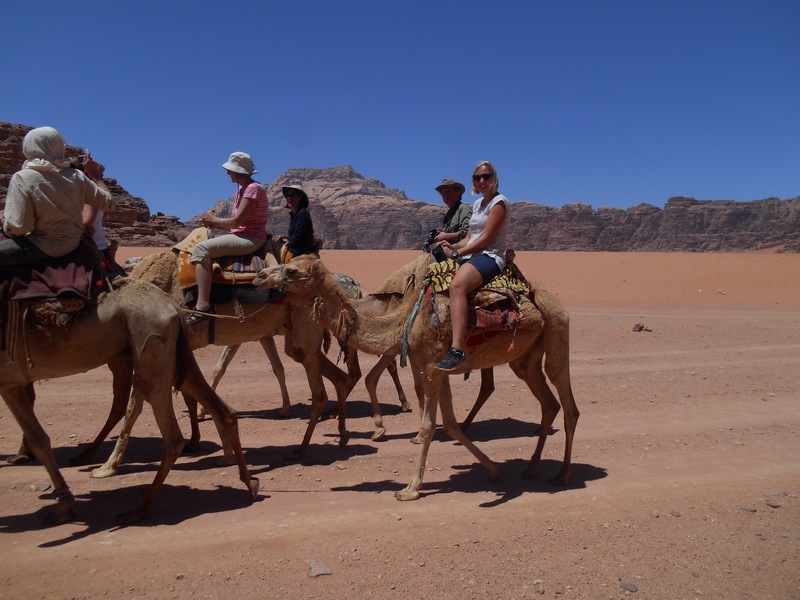 Here we were invited to ride a camel and it was an amazing way to see the surrounding scenery in a convoy of 8 camels led by two Bedouin men. 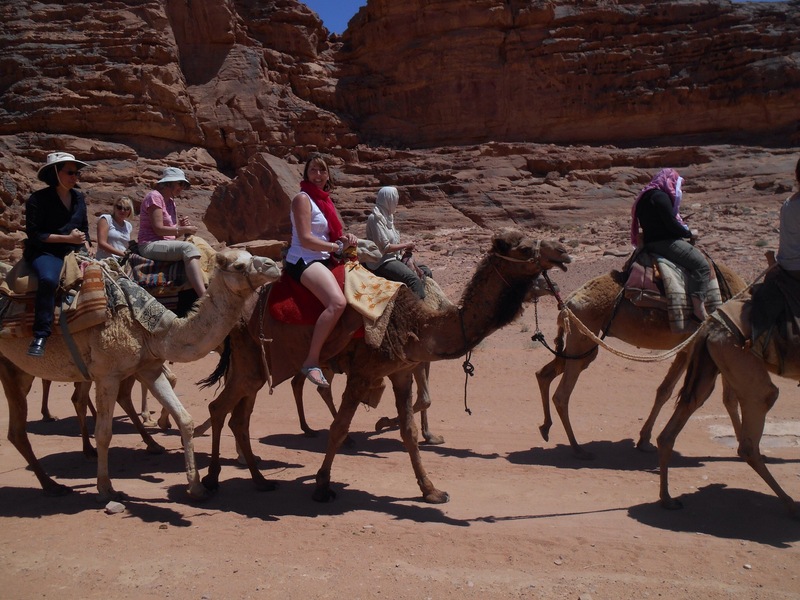 The camels gave throaty calls to each other whilst we enjoyed the towering vantage point of this strange creature. We were shown several wonders of the desert including a plant which when crushed lathered up to reveal a natural soap. 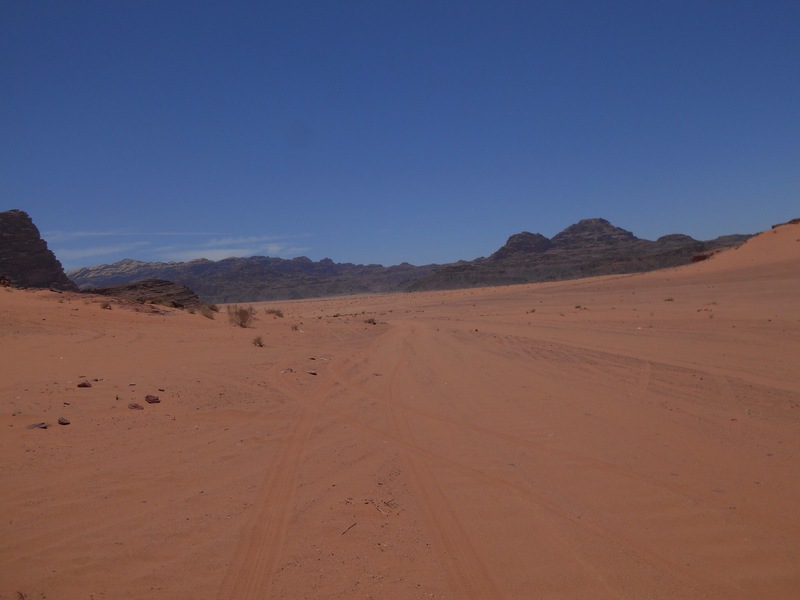 The vast desert is also used frequently as a movie set, featured in Laurence of Arabia and most recently ‘The Martian’ to depict an otherworldly Mars like setting. Lunch was served at a beautiful Bedouin camp, carefully hidden until our approach. We had once again the fresh delights of a middle eastern meal, before getting back in the bus for a long drive north. All too soon it was time to head north to the King Hussein bridge border crossing where we passed quickly through Jordan’s exit procedures. Entry back into Israel was of course more comprehensive and we had been advised to stick together to ease the process should anyone incur any extra questioning. Back in Israel successfully we headed upwards to Jerusalem.